In 2016, it was reported that over 30% of US households own a single serve brewer. With this expanding market, Crystal Geyser is excited to announce the availability of Tejava single serve tea pods and a partnership with single serve pod manufacturer Intelligent Blends. Tejava is a 100% all-natural, unsweetened black tea that recently claimed 1st place at the Global Tea Championship™ and also holds five 1st place awards from the North American Tea Championship™. “Many of our loyal Tejava fans use these one cup brewing systems. We are thrilled to be able to give them a new way to enjoy their favorite tea,” said Judy Yee, Executive Vice President of Marketing and Innovation for the company. “We heard our consumers tell us they enjoyed Tejava hot as well as iced.” For its initial launch, Tejava has released their Original Black Tea, Black Peach Tea, and Black Pineapple Mango, with the plan of releasing additional blends over the next year. Another key component in this new offering from Tejava is that all pods are made from a recyclable #5 plastic with an easy peel tab that allows pods to be recycled after use. The Tejava tea pods are available online at Amazon.com with distribution to other retail outlets soon. Tejava will continue to be sold in PET plastic bottles and the traditional 12-ounce and 1-Liter glass containers. Crystal Geyser Water Company was founded in 1977, with a mission to provide the best natural sparkling water in the world. Our name was chosen to represent the purity and clarity of the water, and our highest priority has been to preserve and maintain the water’s refreshing, natural character. Based in California, our company offers sparkling water and a variety of healthy alternatives to sodas and artificially-sweetened drinks. Crystal Geyser remains committed to employing sustainable business practices, using PET bottles, which are BPA-free, phthalate-free, and 100% recyclable. For more information, visit http://www.crystalgeyser.com and www.tejava.com. Intelligent Blends has announced it has renewed/earned certification with a AA Grade through the British Retail Consortium (BRC) under the Global Food Safety Initiative (GFSI) for its manufacturing location in San Diego California. Michael Ishayik, President for Intelligent Blends explains the rationale in seeking the certification. Intelligent Blends is also Certified by BRC/GFSI, QAI/USDA Organic, Costco/GMP, Star K Kosher and Fair Trade. BRC Global Standards is a leading safety and quality certification program, used by over 23,000 certificated suppliers in 123 countries, with certification issued through a worldwide network of accredited certification bodies. Originally introduced in 2006, the Global Standard for Storage and distribution provides the essential certification link between the range of BRC manufacturing standards and the end user, retailer, and the food service company. BRC has been recognized internationally as the leader in food safety certification. As a member of the GFSI, the BRC is committed to continuous improvement of its food safety standards and requires the same continuous improvement from the distribution centers they certify. Intelligent Blends is an exciting new Company dedicated to the pursuit of making single serve cups available to brands & suppliers of all sizes. Intelligent Blends operates a dedicated 50,000 square foot state-of-the-art facility in Southern California and our veteran management team has a combined average tenure of 25 years in manufacturing and co-packing experience. Our advanced, state-of-the art single-serve conversion equipment was custom designed for the launch of Intelligent Blends – from Stainless Steel Nitrogen flushed totes, to grinders and packaging lines, down to the Agtron for testing – our equipment is top of the line and brand spanking new. Serving one of the fastest growing markets in retail, Intelligent Blends has a current capacity of over 200 million single serve cups per year. Buy bulk single-serve pods at wholesale pricing direct from the manufacturer. Fresh batch-roasted gourmet coffees and premium teas in recyclable capsules. If you’re looking for the best value on single-serve coffee and tea and prefer to buy in bulk, Intelligent Blends offers a growing selection of gourmet coffee and tea made for Keurig® and K-Cup® brewers direct from our manufacturing plant to you. With a variety of gourmet coffee and premium tea blends suit most taste preferences, we’re confident that our wonderful line of single-serve pods will impress your taste buds cup after cup. Please fill out this short form to Request Pricing. We look forward to hopefully serving you! Our single-serve beverages contain only fresh, high-quality ingredients. 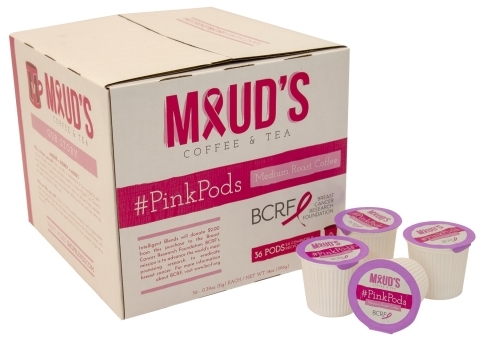 Maud’s Righteous Blends is our own brand of single-serve coffees and teas. Available in 10 blends, Maud’s sources only the finest 100% Arabica coffee beans, which are batch roasted and quickly packed into our advanced recyclable single-serve capsules. Available in 4 blends. Only the finest 100% Arabica coffee beans, that are USDA Certified Organic and Fair Trade certified, are batch roasted and quickly packed into our advanced recyclable single-serve capsules. Available in 8 blends, Maud’s sources only the finest 100% Arabica coffee beans, which are batch roasted and quickly packed into our advanced recyclable single-serve capsules. Available in 4 blends, Maud’s uses only fine premium teas, which are carefully blended and sealed into our advanced recyclable single-serve capsules. Preserving the delicate leafs, our process ensures fresh taste and aroma in every cup.